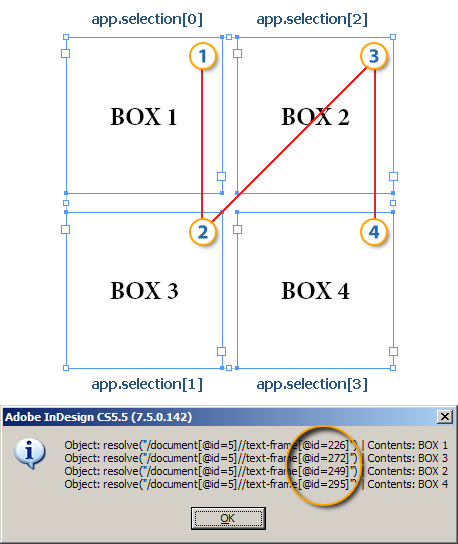 Home > HOT Posts!, InDesign Scripts	> Selection order is back in CS5.5! Few people did some workarounds, but they were based on top to bottom and/or left to right selection structure. Also, I think that APID ToolAssistant by Rorohiko is able to return correct order of selected objects, but I’m not quite sure. BUT, I’m really happy to say that this bug is fixed in CS5.5! I was really excited when I found it working like it should! I felt young again! 😀 It opens so many doors for doing some cool automation things! So, I had put together a simple document and did few tests. }().join('\r'), "Adobe InDesign ver. (" + app.version + ")"
Red line represents selection order. Notice how order of object ID change between horizontal and vertical selection order! This is really awesome! Thank you Adobe for fixing this! Excellent! This means a script for aligning objects in a similar way with coreldraw is possible (align relative to last object in selection, which is a better way in my opinion). This is really an excellent script for indesign. I wish this site was still more active. Ann: Moving all to tomaxxi.com! Adobe Announced Creative Suite 5.5!